At the heart of any sea or ocean wave system for generating power, there is a combination of machines, whose basic function is to convert wave energy to electric ity. There are essentially two system types: those that employ hydro-electric techniques and those that rely on motion sensing of a floating unit. A good example of a hydro-electric scheme is 'Wave Dragon', a system developed in Denmark . An experimental 20 kW version is deployed in a North Sea fjord at Nissum Bredning. The physics underpinning it is very well known to sound engineers. The mechanism is not unlike that of an ear trumpet, which a hundred years ago was a not uncommon way of enhancing hearing. These days they more often appear in comedy sketches poking fun at senility! The horn of the trumpet guides the sound waves, from the large open end of what is essentially a metal cone, towards a narrow 'throat'. It is designed to concentrate these waves with sufficient power at the 'throat' to form a 'focused' sound wave that is strong enough to overcome the hearing loss suffered by the user. For efficient focusing, it is critical that the waves striking the horn aperture should be essentially unidirectional and that they should arrive at the device with a uniform phase front. This means that the horn cannot be too close to the sound source. In the Danish wave collection system, which is a floating structure, reflecting 'booms' form a two dimensional horn, at the 'throat' of which is a ramp. This ramp feeds the enhanced waves towards an artificial lagoon well above sea level. The major problem with sea and ocean waves is consistent wave direction and 'good' phase fronts, and this is not helped by operation in a sea inlet or near the shore. But if a reasonable level of focusing is achieved the significantly raised wave magnitude at the ramp, will allow water to collect to a useful height in the huge floating pond. Like a hydro-electric reservoir, the artificial lagoon can potentially store large amounts of energy. Measurements [19, 20] on the Nissum Bredning prototype indicate that the efficiency in converting wave power to potential energy in the lagoon/reservoir is no more than moderate, at 30%. A low head turbine of the Kaplan type and a conventional hydro-electric generator convert the lagoon energy into electricity. Conversion efficiencies from potential energy to electrical power are no different to those of an equivalent hydro-electric system of comparable power: typically 75%. Consequently, ocean wave power stations of this type are unlikely to extract much more than 20% of the energy in the waves. Motion type systems for extracting wave power are designed with two basic requirements in mind. First, the energy gathering mechanism, associated with the motion of the sea, must be isolated, as far as possible, from the mechanism for converting the extracted mechanical power to electrical power. This maximises system reliability in the harsh marine environment. A second requirement is that the principle of operation must be very robust and the machines designed to implement it must be capable of withstanding the most severe battering from ocean storms. Again there are two types: wide structures aligned at right angles to the incident wave direction (terminators), and long thin usually floating structures aligned in the direction of travel of the waves (attenuators). Examples of terminators that have been proposed in recent years, are the Salter duck, the Cockerel raft, the clam, and the oscillating water column (OWC). Of these, only systems based on the oscillating water column concept have come close to delivering commercial levels of power output. Machines that are not at an advanced prototype testing stage by 2008 are unlikely to be delivering real power in significant quantities by 2030. So I shall concentrate on examining only OWC operation and efficiency. 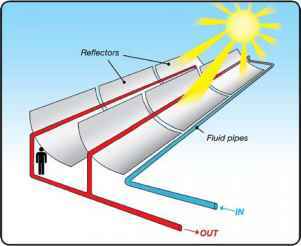 The OWC is based on the concept that an entrained column of water (Fig. 3.5), within a fixed and partially submerged open-ended concrete chamber, will be excited into motion by wave action, and will as a result act as a massive piston. As the trapped water column surface moves up and down it will pump large volumes of air in the chamber above it. For example, a proposed ocean wave farm at Mutriku in Northern Spain will comprise eight concrete water column chambers each 5.5 m in diameter and 3.1 m deep. The anticipated capacity of this system is 0.3 GW. This is small by hydro-electric and wind power standards but is significant for the, as yet, immature wave generation industry. The compressed air above the water column is allowed to escape at high velocity through an aperture at the top of the chamber towards an air turbine and generator. 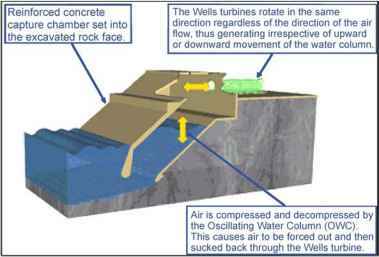 Air is also drawn through the turbine as the water column falls and 'rectifying' turbines have been designed to take advantage of this. The turbines proposed for the Mutriku farm are designed [21, 22] to realise a capture factor of 60%. That is, 60% of the power in the waves will be converted to air pressure in the turbines. Air turbines suitable for the hostile marine environment  are typically 60% efficient in converting the power in the moving air into shaft power at the generator. Induction generators are the best choice for this application and, as we have seen, these machines are capable of 90-95% efficiency. 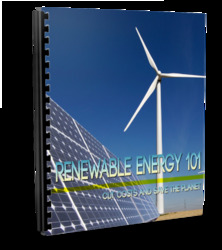 Inverters for the rectifying turbines add 4% to the system losses. Consequently, we are looking at power plants of the OWC type being capable of converting about 33% of the power in the waves into electrical power to the grid. Wave power systems of the attenuator genre include tethered air bag designs in which wave action results in air pressure changes in flexible floats, or rigid floats joined together to form a long articulated structure, which flexes in sympathy with the waves. Of these, only systems of the latter category have advanced to a prototype stage. The best known system is termed Pelamis, which is composed of a series of cylindrical hollow steel segments that are connected to each other by hinged joints . The device is approximately 120 m long and the cylinders are 3.5 m in diameter. It is tethered to the sea floor in approximately 50 m deep water so that the structure remains aligned at right angles to the wave fronts. As the waves progress down the length of the structure it 'ripples' in a snake like fashion and the relative movements are picked up by hydraulic pistons at the hinged joints. The hydraulic actuators pump oil to a hydraulic motor/generator set via an energy smoothing system. The capture efficiency in converting wave power to hydraulic power is comparable with the OWC at about 60%, while the hydraulic motors typically exhibit efficiencies of the order of 85%. With a 90% efficiency for the electrics - asynchronous generator, plus 11 kV to 33 kV transformer - the efficiency in converting wave power to grid power for a Pelamis system is estimated to be about 45%. Nevertheless, it is enough to have encouraged Portugal into developing the world's first commercial wave farm, at the Aguzadora Wave Park near Póvoa de Varzim. The farm will initially use three Pelamis P-750 machines generating 2.25 MW. Subject to successful operation, a major investment is planned by 2009 for a further 28 machines building to a capacity of 525 MW.